← Mayday! Mayday! Booklover’s buffet party tomorrow, May 1, 2014–great indy book finds! This is lifted directly from Cindy’s site today (fine, yes, with her permission). We’re hopping from her site to mine next week, talking about our writing processes. I’ve literally cut and paste her blog into mine and am frankly testing out how well that slapdash of a plan works. So here ’tis! Over to Cindy! Have you ever wondered how authors write their books? Heather Haven, a hysterically funny mystery author, asked me to participate in a blog hop devoted to how writers go through their process of writing. New writers frequently ask me for the secret to how they should write. The secret is that there is no secret. All writers eventually develop their own style and a process that works for them. Even though I’m almost finished with the fourth book in my Laurel McKay mysteries, my own writing process has continued to evolve. I’m far more efficient now than when I started. However, one thing remains constant for every author I know – we can find 101 ways to procrastinate. The other constant is that tenacity is our middle name. WHAT AM I WORKING ON AT PRESENT? I am eighty percent finished with the first draft of Dying for a Dude. Part of my growth was learning to be comfortable with that “sh***y” first draft that author extraordinaire Anne Lamott discussed in her book, Bird by Bird. Once I realized that every one of the 80,000 words in my first draft could be revised (and they frequently are) I felt free to explore the many paths my protagonist wants to take. I still marvel at the magic that occurs when my fingers hit the keyboard each day. Please note my laptop is on my wet bar, conveniently located next to the wine refrigerator! I specialize in what one reviewer referred to as “feel good” humor. My protagonist, Laurel McKay, is a thirty-nine-year old single soccer mom, the kind of woman you want to have as your best friend. She has plenty of foibles, but she is a decent person, intent on raising her kids properly. Eventually she hopes to settle down with that special man, the one who makes her heart and body sing. Of course, I keep messing with Laurel, forcing her to stumble over a dead body here and there. But if it wasn’t for those dead bodies, Laurel would never have met Detective Tom Hunter. I feel it’s important to have several relevant themes going on in the book as well as a basic whodunit mystery, all of which will enrich the reader’s experience. Every day we hear about heartbreaking stories or tragic events that have occurred, sad tales of loss and despair. We all need something to brighten our day and that is part of my mission. While I love to solve a good puzzle myself, I also want people to enjoy an occasional laugh-out-loud moment when they are reading one of my mysteries. Many people have purchased my books as gifts for friends coming out of the hospital. The only requirement is that the patient does not read them until their stitches have been removed. Process? I’m supposed to have a process? Come closer while I share a secret. I don’t write every day. Gasp! Except for emails so maybe that counts. In the early years, I was known as a binge writer. No, that doesn’t refer to the excessive amount of Kit Kat bars I consumed. My preference is still to carve out a week where I can write all day and night, with no social or author events to distract me. I can produce ten to fourteen pages daily in that type of immersion environment. I’ve also learned to treat my writing as a profession, so most days I churn out from two to six pages. Then there are the annoying days when I delete more words than I add. It’s all part of the process. As far as plotting, every author occasionally reaches a point where he or she is stumped. I find it helps to plot and plod. I walk around the house with my cat, Zoey from the Bronx, following right behind me. I call this my creative exercise program. But it works for me. Then if I’m still in a plotting funk, I go look at open houses. Seriously –– whatever it takes to get those creative juices flowing! Chocolate works wonders to fuel your word count! I would love to know more about your writing process, or any other creative endeavor. Leave a comment by June 22nd and you’ll be entered in a drawing to win a $10 Amazon gift card. Next week two of my favorite humorous mystery authors will discuss their writing process. Check them out. 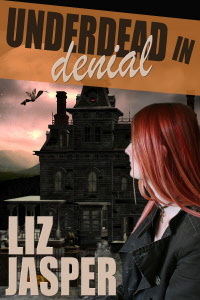 LIZ JASPER writes curl-up-on-the-couch-with-chocolate paranormal humorous mysteries. Her first novel, Underdead, about a science teacher who is turned almost into a vampire, won the 2008 EPPIE Award for Best Mystery. The sequel was Underdead In Denial, The third in the series, Underdead with a Vengeance, is a new release. She also has published the first novel in a humorous demon princess trilogy for teens. 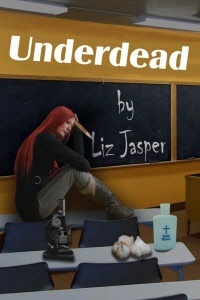 Liz is currently working on the next book in her Underdead series. Visit her at http://www.lizjasper.com. DIANA ORGAIN is the bestselling author of the Maternal Instincts Mystery Series: Bundle of Trouble, Motherhood is Murder, Formula for Murder, and Nursing a Grudge. She is the co-author of GILT TRIP the next book in the NY Times Bestselling Scrapbooking Mystery Series by Laura Childs. Diana’s new Reality TV Mystery series will be published by Penguin in Spring 2015. She lives in San Francisco with her husband and three children. Visit her at http://www.dianaorgain.com.